In this blog we try to explain about Ambari and its uses, Status of the Ambari on ARM64. Apache Ambari is an open source administration tool deployed on top of Hadoop cluster and responsible for keeping track of running applications and their status. Apache Ambari can be referred to as an open source web-based management tool that manages, monitors and provisions the health of Hadoop clusters. The Apache Ambari is currently one of the leading projects running under Apache Software Foundation. The reason is that Ambari eliminates the need for manual tasks used to watch over Hadoop operations. It gives a simple secure platform for provisioning, managing and monitoring Hortonworks Data Platform (HDP) deployments. The genesis of Apache Ambari traces the emergence of Hadoop when its distributed and scalable computing took the world by storm. More and more technologies were incorporated in the existing infrastructure. Gradually Hadoop matured and it became difficult for the cluster to maintain multiple nodes and applications simultaneously. That is when this technology came into picture to make distributed computing easier. It's a completely open source management platform for provisioning, managing, monitoring and securing Apache Hadoop clusters. Apache Ambari takes the guesswork out of operating Hadoop. Apache Ambari, as part of the Hortonworks Data Platform, allows enterprises to plan, install and securely configure HDP making it easier to provide ongoing cluster maintenance and management, no matter the size of the cluster. Replace needarch variable hard coding of x86_64. Replace npm/Node version in your distribution. The phantomjs versions which is having AArch64 support. Use the ember-handlebars-brunch version which has got ARM64 support. Replace hardcoded amd64 values for deb.architecture variable. The RPM/JDEB support patches for couple of missing packages. The Ambari do not have any AArch64 bits, It has x86 bits hard coded in all places. We have fixed it from v2.5 and used bigtop to make the build then wrote mpack (Management pack) specs and used bigtop as mpack. We have created a collaborate page to Build and Install the v2.6.1 Ambari. If you want to build different version, It may be required to slightly tweak the patches depending on the version which you want to build. These patches you may find on our linaro git repositories. In this section we try to explain example v2.6.1 Apache Ambari build from scratch on both CentOS and Debian/Ubuntu machines. The versions are very important The latest version build method will be almost similar with some minor changes. To build latest version of the Ambari use my git repository on git.linaro.org. The repository usually up to date with patches here are usually forward ported. Make sure the version of Maven is 3.5.3 when the following command is issued. OS name: "linux", version: "4.12.0-1.1.aarch64", arch: "aarch64", family: "unix"
CentOS7, nodejs/npm need to be built from source. The version of built out binaries are: nodejs@v4.2.6, npm@2.14.12. As long as they are installed, pom.xml in ambari-admin needs to be changed to reflect these versions. The target nodejs/npm version are defined in "configuration" field of "frontend-maven-plugin". Install phantomjs-2.1.1-linux-aarch64.tar.bz2 to the system and add phantomjs to $PATH. Ambari uses fronend-maven-plugin@v0.0.16, which doesn't support AArch64. Do following to rebuild this plugin for AArch64. levedbjni is used in Ambari-metrics. It only provides x86/x86_64 version in maven repo. So AArch64 version of leveldbjni needs to be built and installed. On CentOS 7.4 to generate rpm's you can issue below command. On Debian 9 to generate Debian packages you can issue below command. RPM will be created under AMBARI_DIR/ambari-server/target/rpm/ambari-server/RPMS/aarch64. RPM will be created under AMBARI_DIR/ambari-agent/target/rpm/ambari-agent/RPMS/aarch64. RPM will be created under AMBARI_DIR/ambari-metrics/ambari-metrics-timelineservice/target/rpm/ambari-metrics-collector/RPMS/noarch. Then install the Ambari Server RPM. The initial username/password is admin/admin. Install the Ambari Agent RPM. Then edit the location of Ambari Server in /etc/ambari-agent/conf/ambari-agent.ini by editing the hostname line. 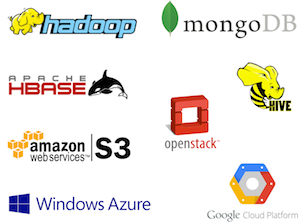 The purpose of this blog is try to explain about different types of benchmark tools available for BigData components. We did a talk on BigData benchmark Linaro Connect @LasVegas in 2016. This is one of my effort to collectively put into a one place with more information. The laptop come with default ubuntu installed. In that case the username, usergroup they have created by default. This blog explains you how you can rename the default username and group with your own username, group. Unix-like operating systems decouple the user name from the user identity, so you may safely change the name without affecting the ID. All permissions, files, etc are tied to your identity (uid), not your username. STEP 1: Reboot your laptop with 1 as a command line parameter. The laptop will be booted into a rescue mode with 1 as a parameter. You can also boot your laptop in a single user mode. STEP 2: Change your root password with the command "passwd"
This is just tobe secured in future, because one can easily hack your laptop with your default user password. Apache Drill is a distributed MPP query layer that supports SQL and alternative query languages against NoSQL and Hadoop data storage systems. It was inspired in part by Google's Dremel. Apache Drill is an Apache Foundation project. With the exponential growth of data in recent years, and the shift towards rapid application development, new data is increasingly being stored in non-relational datastores including Hadoop, NoSQL and cloud storage. Apache Drill enables analysts, business users, data scientists and developers to explore and analyze this data without sacrificing the flexibility and agility offered by these datastores.